Inspired by the heady days of lounging on a Caribbean beach, Escada Island Kiss Eau De Toilette captures that luscious feeling of water lapping the shore in smooth ripples and bright sunshine forming dimples of light on the ocean. As the beach bar starts to throng, the DJ spins summer tunes that echo the rhythm of the tide, set against the backdrop of breathtaking colours emblazoned across the sky. 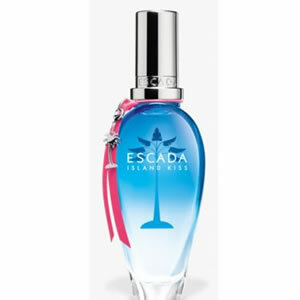 A simple splash of Escada Island Kiss Eau De Toilette for women makes for joyful moments that wash over in a blissful haze. A warm and modern fruity floral, Escada Island Kiss Eau De Toilette reflects Escada's core heritage of fragrances for women with its blend of tropical red fruit and oriental floral notes. The exquisite trio of orange, passion flower and mango top notes off a mixture of sweet tropical passion brought to life with a hint of citrus freshness. The heart notes of floral magnolia and juicy peach provide a splash of warmth, while at the base, red fruits are blended with sultry woods and musk to ignite the passion of the fragrance.